Winfield Attends Air Force-Convened Meeting - Winfield leaves his post to attend what a 9/11 Commission memorandum will call “an unrelated, closed-door personnel meeting convened by the Air Force to discuss the rating of Air Force officers.” [9/11 Commission, 7/21/2003 ] Another Commission memorandum will state that this meeting is a “session for general officers who rated Air Force officers.” It is unclear whether the meeting takes place somewhere in the NMCC or outside the center. The Commission memorandum will only say that it takes place “elsewhere in [Joint Chiefs of Staff] spaces.” At least one of the NMCC’s other qualified DDOs, Brigadier General Norman Seip, is also attending it. Winfield Asked Colleague to Replace Him on Previous Day - Winfield is temporarily replaced as DDO by Captain Charles Leidig. 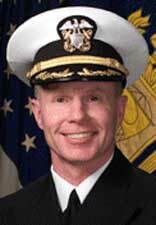 Leidig only joined the operations directorate of the Joint Chiefs of Staff in July 2001, when he assumed duties as the deputy for Command Center operations. In that, his usual role, he is responsible for the maintenance, operation, and training of watch teams for the NMCC. 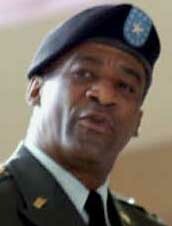 He qualified to stand in as the DDO in the NMCC about a month ago, in August 2001. The previous afternoon, Winfield asked Leidig to relieve him for a portion of his duty this morning, and Leidig agreed to do so. Officers in the National Military Command Center (NMCC) at the Pentagon begin notifying senior Pentagon officials about the plane crashing into the World Trade Center after learning of this from television, but they are apparently unaware of the hijacking of Flight 11. [9/11 Commission, 7/21/2003 ; 9/11 Commission, 4/29/2004 ; 9/11 Commission, 7/24/2004, pp. 35] The NMCC’s three main missions are monitoring worldwide events for the Joint Chiefs of Staff (JCS), maintaining a strategic watch component, and maintaining a crisis response component. The NMCC has live feeds from numerous television stations, and the operations team on duty there learned from CNN that an aircraft had hit the WTC (see (8:48 a.m.) September 11, 2001). Brigadier General Montague Winfield. [Source: US Army]Brigadier General Montague Winfield, the deputy director for operations (DDO) in the National Military Command Center (NMCC) at the Pentagon, apparently remains in a pre-scheduled meeting that is unrelated to the terrorist attacks and does not resume his key duties as DDO, even though others in the NMCC have concluded that the US is under attack. [9/11 Commission, 4/29/2004 ; American Forces Press Service, 9/7/2006] Since around 8:30 a.m., Winfield has been attending what the 9/11 Commission will describe as a “closed-door personnel meeting convened by the Air Force to discuss the rating of Air Force officers.” Captain Charles Leidig, who only qualified to stand in as the DDO about a month previously, has taken over Winfield’s position while he is in the meeting (see 8:30 a.m. September 11, 2001). Winfield Stays in Pre-Scheduled Meeting - According to the 9/11 Commission Report, “The job of the NMCC in such an emergency is to gather the relevant parties and establish the chain of command between the National Command Authority—the president and the secretary of defense—and those who need to carry out their orders.” [9/11 Commission, 7/24/2004, pp. 37] However, Winfield does not return to his post, and apparently remains in the Air Force-convened meeting. The reason for this is unclear. According to one 9/11 Commission memorandum, “Such meetings” as Winfield is attending “are generally not disturbed unless the reason is significant.” Winfield will only resume his duties as DDO after Flight 93 crashes in Pennsylvania, apparently at around 10:30 a.m. (see (10:30 a.m.) September 11, 2001). [9/11 Commission, 4/29/2004 ; 9/11 Commission, 6/17/2004] Whether Winfield and the other officers with him in the meeting learn that America is under attack immediately, or are only notified of this later on, is unstated. 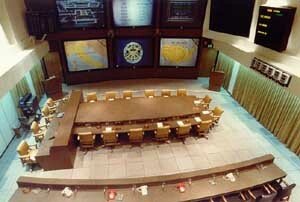 NMCC Directors Decided to Establish Conference - After those in the NMCC saw Flight 175 hitting the WTC live on television at 9:03 a.m. (see 9:03 a.m. September 11, 2001), Captain Charles Leidig, the acting deputy director for operations (DDO) in the center throughout the attacks, and Commander Pat Gardner, the assistant DDO, talked about the need to convene a significant event conference so there could be a discussion of what actions were to be taken in response. The DDO and the assistant DDO are the two officers responsible for deciding what type of conference the NMCC should convene, and when it should do so. Because there is no specific procedure for dealing with terrorist attacks, Leidig and Gardner decided a significant event conference would most suit their needs, because it would have the flexibility of allowing more people to be added in as required. They also discussed who would need to be on this conference. [9/11 Commission, 4/29/2004 ] But Major Charles Chambers, who is currently on duty in the NMCC, will give a slightly different account. According to Chambers, Staff Sergeant Val Harrison had a phone in her hand and said NORAD was asking for a significant event conference. Leidig had agreed, and so Harrison started establishing the conference. The National Military Command Center (NMCC) at the Pentagon commences an “air threat conference” at 9:37 a.m. in response to the terrorist attacks, which will last for more than eight hours and have numerous high-level government and military officials participating at various times. Deputy Director Ordered Upgrading of Conference - All the same, Leidig gave the order to transition to an air threat conference. [9/11 Commission, 7/24/2004, pp. 37] He will tell the 9/11 Commission that, in retrospect, the reason he thinks he did so “was because he perceived an air threat at that time.” [9/11 Commission, 4/29/2004 ] Therefore, the significant event conference was brought to an end at around 9:34 a.m., and resumes as an air threat conference three minutes later. [9/11 Commission, 7/24/2004, pp. 37] Staff Sergeant Val Harrison could have established the air threat conference either by leaving all of those participating in the significant event conference on the line and then adding new participants one at a time, or by simply hanging up on everyone in the significant event conference and then having the computer do a mass dialing. Harrison recommended the second option. Leidig had agreed, and directed her to disconnect the conference call and start over. 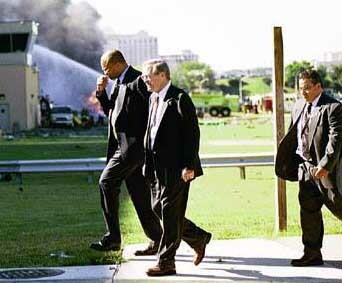 This picture of Rumsfeld (center), taken from the US Army website, is captioned, “Secretary of Defense Donald H. Rumsfeld returns to Pentagon inner offices Tuesday morning after surveying the damage from the hijacked plane which crashed into the building moments before.” This contradicts his claim that he was helping victims for nearly an hour after the attack. However, there is video footage of Rumsfeld helping a person on a stretcher and it is not known when this picture is taken exactly. [Source: US Army]Captain Charles Leidig, a deputy who is temporarily in charge of the Pentagon’s National Military Command Center (NMCC), is handling the NMCC’s crisis teleconference. He opens the call saying, “An air attack against North America may be in progress.” He mentions reports of a crash into the opposite side of the Pentagon, and requests that Defense Secretary Rumsfeld be added to the conference. [9/11 Commission, 6/17/2004; 9/11 Commission, 6/17/2004 ] Rumsfeld has a crucial role to play in coordinating the military response to an attack on the US. According to journalist and author Andrew Cockburn, since the Cold War, “In an age when an enemy attack might allow only a few minutes for detection and reaction, control of American military power became vested in the National Command Authority, which consists of the president and the secretary of defense. Collectively, the NCA is the ultimate source of military orders, uniquely empowered, among other things, to order the use of nuclear weapons. In time of war, therefore, Rumsfeld was effectively the president’s partner, the direct link to the fighting forces, and all orders had to go through him. Such orders were supposed to be transmitted from… the National Military Command Center.” Cockburn adds that the NMCC is “the operational center for any and every crisis, from nuclear war to hijacked airliners.” Yet, rather than join the NMCC conference, Rumsfeld has already gone out of the Pentagon to see the crash site, without telling any of his command staff where he was going, and remains out of contact for some time (see Between 9:38 a.m. and 10:00 a.m. September 11, 2001). Therefore, a few minutes after Leidig makes his request, Rumsfeld’s office will report back that he is nowhere to be found. Cockburn concludes, “The chain of command was broken.” [Cockburn, 2007, pp. 4-5; Democracy Now!, 3/7/2007] It is unknown whether Rumsfeld has a cell phone or pager on him, and if so, why he cannot be reached. Winfield Returns to His Post, but Timing Unclear - Now Winfield finally relieves Leidig and resumes his duties as DDO. This happens after Flight 93 has crashed in Pennsylvania (see (10:03 a.m.-10:10 a.m.) September 11, 2001 and (10:06 a.m.) September 11, 2001), although the exact time is unclear. In a private interview with the 9/11 Commission, Leidig will say he is “certain that Winfield returned [from the meeting] after the Pentagon was hit” at 9:37 a.m. (see 9:37 a.m. September 11, 2001), but he “is not certain of Winfield’s arrival in relationship with the vice chairman” of the Joint Chiefs of Staff, General Richard Myers. [9/11 Commission, 4/29/2004 ] (According to the 9/11 Commission Report, Myers arrived at the NMCC shortly before 10:00 a.m. (see (Between 9:55 a.m. and 10:25 a.m.) September 11, 2001). [9/11 Commission, 7/24/2004, pp. 38] ) Winfield then takes over as DDO “at some point in relation to the report of the Pennsylvania crash,” according to Leidig. As the 9/11 Commission will point out, since the crash of Flight 93 happened around 10:03 a.m., “any reporting would be after that time.” [9/11 Commission, 4/29/2004 ] During a public hearing of the 9/11 Commission, Leidig will similarly say that Winfield takes over from him “[r]ight after we resolved what was going on with United 93.” He will also say that a report over the NMCC’s air threat conference at 10:37 a.m., about an anonymous threat against Air Force One (see (10:32 a.m.) September 11, 2001), occurs “right after I was relieved on the watch by General Winfield.” [9/11 Commission, 6/17/2004] This would indicate that Winfield takes over from Leidig at around 10:30 a.m.